Payouts are used to record any cash removed from a cash drawer for a non-sale-related purpose, such as to pay a window washer. 1. 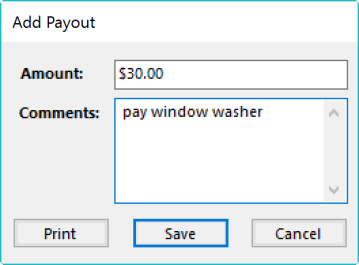 Select Create > Payout... from the Ascend desktop. 2. The Add Payout window opens. 3. 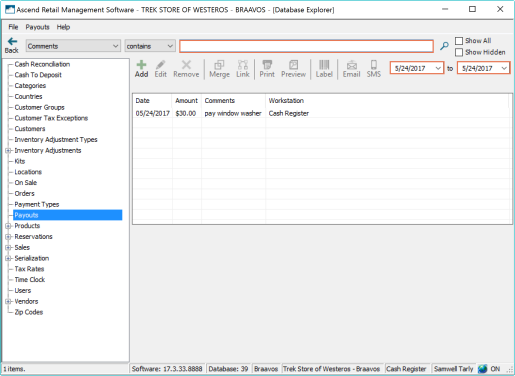 Enter the amount removed from the register into the Amount field. 4. Enter the reason for the payout in the Comments field. 5. Click Save to record the payout. 2. Click Payouts from the menu on the left. Payouts from today show on the right. You can update the Date Range to see payouts from other time periods, or use the Search bar to look through comments.